An Adventure In The Busy City Of Madrid. It was the week after my Birthday and me and the lads were making our way to Gatwick Airport on a rainy, misty afternoon. “The flight is at 6:45 p.m.” I said, “why are we leaving at 4:00 p.m.” We had two hours left to get to the gates, heart beating like an 808 drum, a sensation of coldness starts creeping up our feet from underneath our seats in the cab. We arrived just in time to the airport but the gates had closed. This was the cliff note’s version of the story and the experience of missing our flight was one that we did not really expect. There is a first time in everything we guessed. We had met up a few times to plan this trip before and we wanted an adventure, I guess missing the flight was a good omen. To start our week, we landed at the heart of the city of Madrid. The weather was not cold it was between 18-22 degrees Celsius. On our first day we visited the oldest Restaurant in the world as declared by Guinness world records. The restaurant is called “El Botin”. Locating this place in the city of Madrid turned out to be a manageable task as my friend seemed to have had a built in compass and world map inside his head. In our later ventures, we definitely could not leave without him as it was the most efficient way of utilizing our time. Things to note in the restaurant: the food we had was exquisite. I ordered a slow roast pork, combined with baked, deep fried potatoes. My friends ordered similar dishes although they were chicken and fish. Its a very small restaurant but after one visits the interior you could really feel the traditional essence of this restaurant from the golden days. 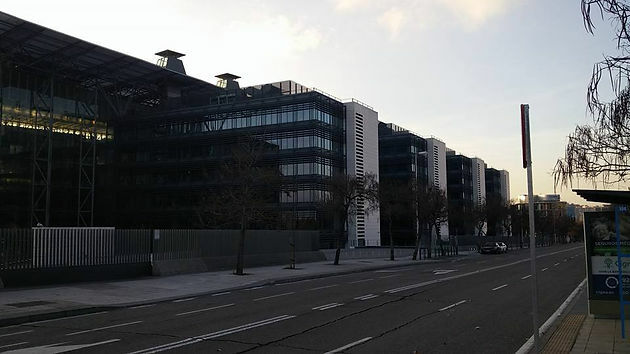 Our next stop was familiarizing ourselves with the surroundings and places within Madrid. It is a very busy city and because we had rented out a room right bang on where everything is happening in Calle de Jardine; we were a few minutes away from 2 major stations Sol and Gran Via, even on the night we were surrounded by loud music and people during a pre-Christmas weekend. 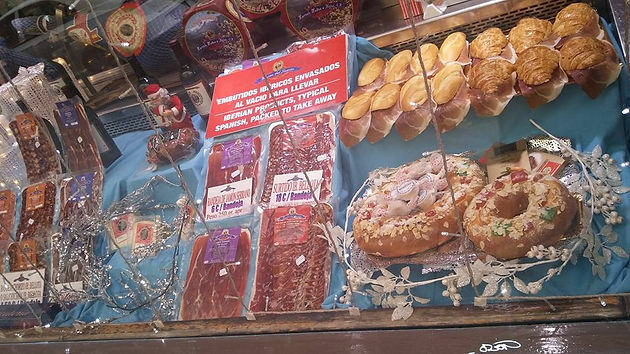 On the next morning, we ventured to Plaza de Mayor – the city’s main shopping centre. The pound to euro trade off was between a pound to 1.30 (which was not that great to be honest during this time). The prices of restaurant food in the inner city was matchable to that of the price in London, however the Calamaris here was the bargain food. Calamaris are everywhere and you could bag in a plastic full of it stuffed in a bun for around 2 euros. These were many times were our lunch and snacks. For dinner, we would treat ourselves with some luxury dinner food such as Spanish tapas and we tried our sweet tooth to some hot chocolate and churos. We could not leave Madrid without visiting the Stadium. 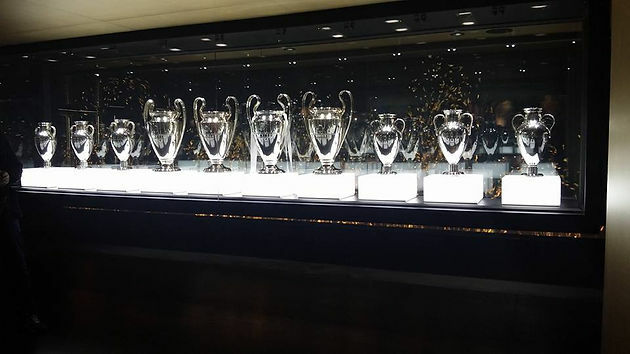 Out of all the places we have visited this is my highlight as Madrid is ranked the best football team at this time of writing., We gad a tour inside where we were able to see a collection of trophies, medals and garments used by footballers. The stadium could hold up around 80,000 people although when I got inside I wondered whether this could be true. Some developments to increase the capacity of this stadium was being planned. A notable item in this tour was the football league cup. I took loads of photos and I have put some below. The tour itself kind of took half our day. 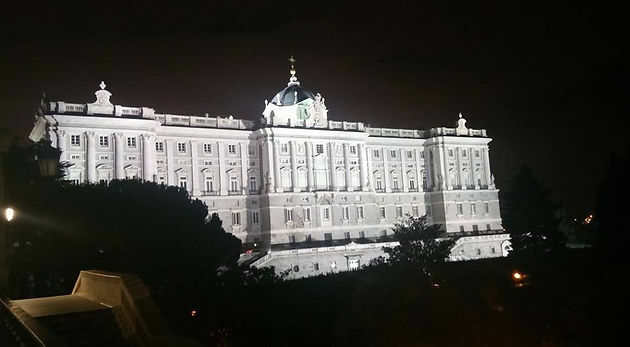 On the Evening we made our away to the Spanish Egyptian Pyramid and then the Royal Palace of Madrid which was not far off away from it. One thing to know about this pyramid is that it is not the pyramid you imagine like in Egypt in fact, the pyramid was not triangular in shape it was along rectangle. We were unable to get inside but from looking at the pyramid outside it was small. But hey, I have yet to go to Egypt and see some real pyramids so this one will do for me for now.